I mistakenly assumed that the goal in my life is to be an entrepreneur. I now think it’s wrong. Being an entrepreneur is a means to an end. It’s not a goal. It’s not THE final result. Being an entrepreneur is like making money. Money is a transaction medium for the value that a product or service promises to deliver. Money should not be the goal, but a byproduct of your actions. Money is an outcome of your promises — the value you deliver by solving someone’s else problem or satisfying someone’s else need. Money is the reward (product) NOT the goal (purpose) of being an entrepreneur. For me, being an entrepreneur is a way of life. It’s a mindset. It’s a purpose. It’s a calling. For some, it’s a conscious decision about how to live their life. For others, it happens by accident. They slip into becoming an entrepreneur. 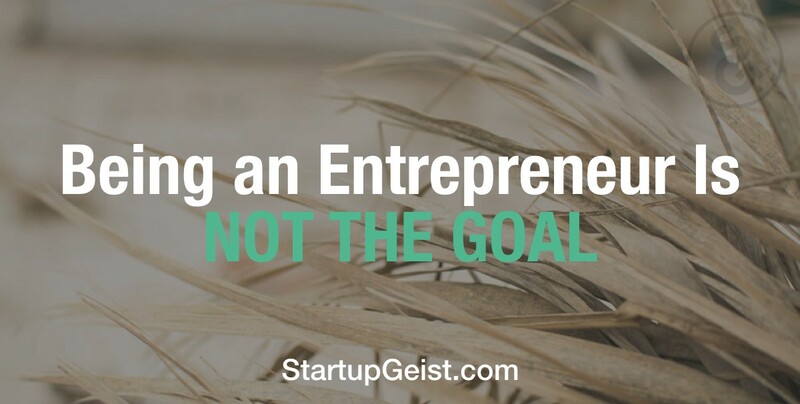 Either way, being an entrepreneur is ONLY a means to an end — not the goal. I’m aware that I’m repeating myself within the first paragraphs already but for me it’s the MAIN point that I want you (preferably students and recent graduates) to understand. As with most things, it’s not about the labels, the titles, the categories. In particular, it’s not about being an employee. It’s not about being an entrepreneur. Be aware of not being put into these categories. Don’t put yourself into them either because by doing so you limit yourself. It creates a fixed mindset about what ‘you’ think about each category. It’s these stories we tell ourselves that stop us from truly embracing the opportunities out there. It’s these stories that stop us from truly developing our true self, unleashing our talents and strengths. Let’s be aware of these self-limiting stories. Whenever they come up and try to stop us from moving forward, let’s observe them and make a conscious decision whether to follow them or not. And mostly you’ll discover that you don’t want to follow them. Instead, set your own direction and your own rules to live the life you want — independently from other people’s expectations. Originally published at dannyholtschke.com on March 31, 2016.